TM Hughes and Son are specialists in bathroom installations and refurbishments with many years of experience. We work closely with all customers to ensure your requirements are met. We have qualified engineers, who will carry out all the work required for your new bathroom; this includes plumbers, heating engineers, tilers and electricians. When fitting bathrooms, we ensure the work is planned meticulously, and the different trades work seamlessly together, resulting in a perfect finish. To ensure we design to fit your dream bathroom, we will send one of our Chelmsford based bathroom fitters to your home to go through your requirements and give you a free no obligation quote. The first step is to measure your bathroom space and take into consideration any windows and doors. We will then go through your requirements and any current design ideas you have; we can answer any questions you may have and offer suggestions we will then go through each part of the Bathroom and make sure we know exactly what you want. By the end of the meeting, we will have a solid plan on how to design and build a beautiful bathroom to your exact taste with exceptional functionality for your exact needs. We can design your bathroom using a bathroom suite or with individual Baths, Toilets, Showers and Basins whatever style you want we can create the look. The design of your bathroom is defined by your choice of bathroom suite; a classic suite will be accompanied by traditional flooring and walls while a modern bathroom will have a modern floor and walls. Traditional Bathroom suites are mostly white with rounded edges and classic features such as free-standing baths, chrome or bronze single pillar taps, mixer showers and close coupled or chain flushed toilets. 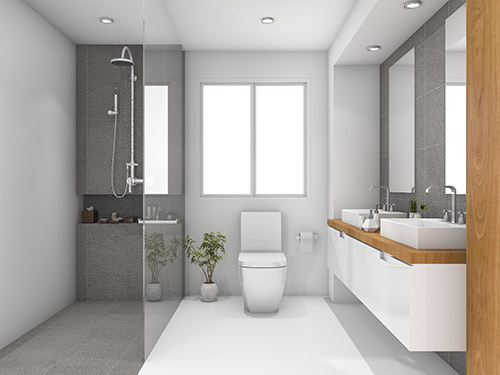 Modern Bathroom Suites are available in many exciting shapes and sizes with features such as back to the wall, wall hung and corner toilets, mixer and monobloc taps and shower enclosures. The most important aspect when looking for Bathroom Flooring is that it has to be water resistant and have good non-slip properties, the flooring also has to compliment your decor and bathroom suite. Your choice of flooring will depend on who is using the bathroom, for example adults are less likely to slip than children and less likely to splash lots of water over the floor (which young children are notorious for doing) so tiles can be safely used if the bathroom is only used by adults. If you have little ones rubber or vinyl might be a better choice as they are softer incase a young child should slip over. Wood flooring isn’t the best choice for your bathroom as wood, and the standard laminate is prone to warping when wet. A good quality engineered wood flooring is made up of many different layers and is less prone to water damage than standard wood flooring so can be used in some bathrooms if you want a wood finish floor. Engineered Wood Flooring needs more care and attention than other types of bathroom floors any water splashed on the floor will need to be cleaned up ASAP because of this wood flooring is not the best choice when you have children. Wood finish tiles and vinyl are available if wood’s not suitable for your home. Ceramic or Porcelain tiles are an excellent choice for the bathroom they are very hardwearing, 100% watertight, easy to clean, stain resistant and hygienic. Bathroom floor tiles are available in glazed and unglazed versions; unglazed tiles are less prone to chipping than glazed tiles they do however need to be glazed once they are laid (unlike glazed tiles). Tiles can be cold underfoot which is nice in the summer but can be slightly unpleasant in winter but tiles are an excellent heat conductor so are ideal to use with Underfloor Heating which will ensure they are warm in winter. Your choice of tile will depend on the finish you prefer and your safety requirements the shiny gloss finish of a large glazed floor tile will look amazing but unglazed tiles are less slippery and can be made can be made even safer by using smaller tiles, the added grout lines increases non-slip properties. Rubber Flooring is available on a roll or as tiles with lots of designs and colours; the rubber is very durable, easy to clean and low maintenance. Textured rubber is recommended as standard rubber tiles can be very slippery when wet. Stone, Slate and Marble have increased in popularity over recent years in the Essex bathroom thanks to advancements in water proofing technology both are incredibly durable and look amazing when polished or honed. Stone, Slate and Marble flooring are more expensive than tiles, and vinyl stone is very porous so needs treating during, and after installation. Stone will need treating every couple of years. Slate and Marble is less porous so is a better choice for the bathroom floor. Vinyl Flooring is reasonably priced, simple to fit and is available in many designs, in tiles or on a roll. Vinyl has high water resistance, is very hard wearing (could last up to 2o years) is soft underfoot and can be used with underfloor heating. The only disadvantage of Vinyl is that it can be slippery when wet. Wall Tiles are probably the most popular choice for the bathroom wall, your bathroom can be partially tiled (around the shower and bath) or fully tiled. Wall tiles are available in ceramic, porcelain and natural stone. Ceramic and Porcelain tiles are superior to natural stone tiles in many ways they are less porous, easier to work with and have better stain and scratch resistance. Stone tiles are harder to clean and require maintenance; they will need resealing every two years. Ceramic tiles are the most readily available wall tile, are easier to cut and are available in many different designs. Porcelain is stronger than ceramic, less absorbant (only by a small 0.5%) and less prone to cracking. It’s for these reasons that Ceramic tiles are mostly used for bathroom walls while Porcelain tiles are mostly used for bathroom floors. All tiles are available in various shapes (rectangle and square) and size in the finishes Gloss, Matt, Satin and Textured. Bathroom Wall Panels are a brilliant alternative to tiles, they are cheaper, easier to install and easier to clean. Wall panels are very hygienic and available in laminate PVC or acrylic. Acrylic Panels are constructed from engineered polymer they are thinner than PVC and Laminate with an average thickness of 4-5mm they are also denser, heavier and more expensive than PVC. Laminate Panels are made with an MDF or Plywood core that has a high-pressure laminated backing on both sides making these panels 100% waterproof. Laminated panels are available in many bespoke designs and finishes so will be ideal if you’re after a specific look. PVC Panels are the cheapest of the bunch a lightweight, durable material that’s fully waterproof and up to the job. PVC panels are good for those on a budget. T M Hughes and Son can fit both wet and electric underfloor heating with thermostatic controlling – giving your bathroom a comfortable feel and helping to prevent that cold feeling after a bath or shower. Our qualified Plumbers & Electricians make sure all work is done to current regulations, giving you peace of mind. Finally we can design and install all bathroom furniture, lighting and accessories to add the finishing touches to your new bathroom installation.